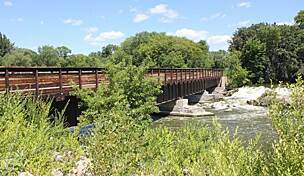 Trail end points: 1st Ave. E. and Main St. at Central Lakes State Trail (Osakis) and River's Edge Park (Waite Park); Railroad Ave. west of 13th St. (Albany) to 450th St. 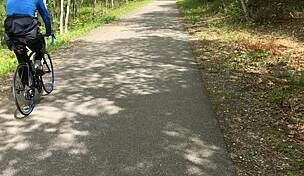 The trail rests on an inactive Burlington Northern Railroad corridor between the cities of Osakis and St. Joseph. 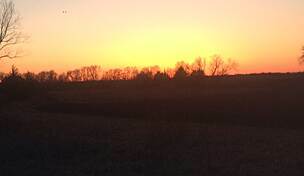 Along the path, which is dotted by trailheads and parking access areas, trail users are treated to scenic views of prairie remnants, lakes, woodlands, and open farmland. In fact, Stearns County is the top dairy producer in Minnesota. 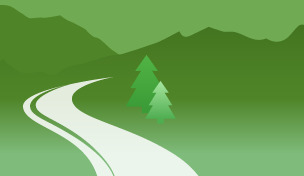 Much of the trail parallels busy I-94, making it a safe alternative for nonmotorized travel in the heart of Minnesota. Not far from the Avon trailhead is St. John’s University, situated on more than 2,000 wooded acres that hold hiking trails and lakes. 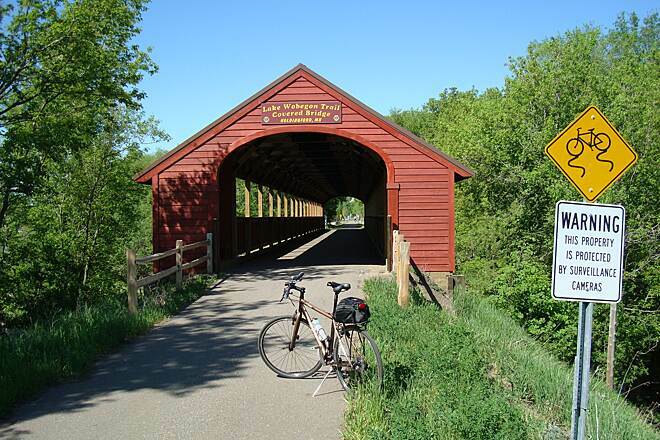 An extension of the Lake Wobegon Trail north from the city of Albany takes trail users to Holdingford, which features the longest covered bridge in Minnesota. Beyond Holdingford, the rail-trail continues even farther north to the Stearns–-Morrison county line at 450th Street, adding another 13 miles of paved trail with this northern extension. 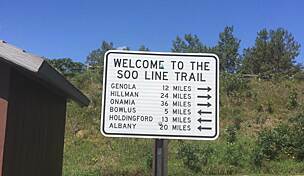 Here, the Soo Line Recreational Trail begins, offering an additional 10.5 miles of paved trail to US 10 just north of Royalton. Ultimately, intrepid recreationists can travel uninterrupted on off-road trails north all the way to Duluth, a distance of more than 150 miles. This is not the only trail connection provided. 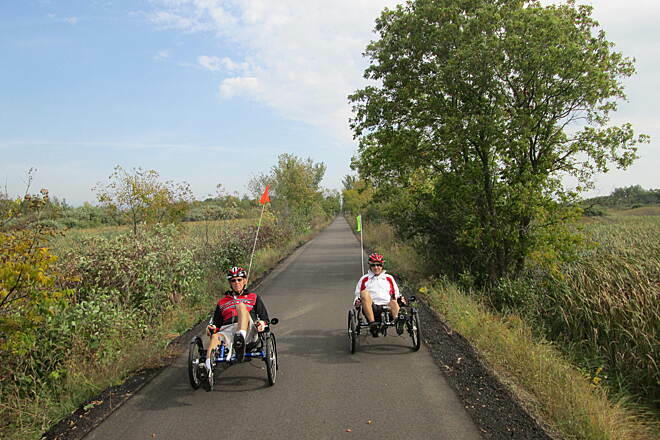 The Lake Wobegon Trail’s western end in Osakis offers a seamless connection to the 55-mile Central Lakes State Trail. 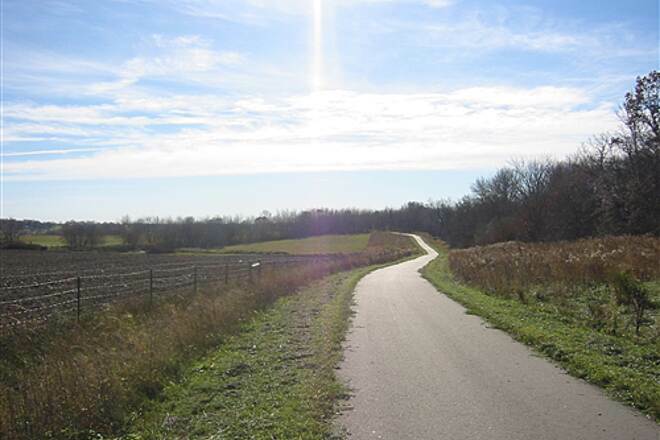 These combined trails give users 115 miles of uninterrupted pavement from St. Joseph to Fergus Falls. 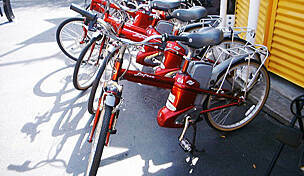 In the near future, the Dairyland Trail will take bikers, walkers, and snowmobilers south from Albany to Brooten. 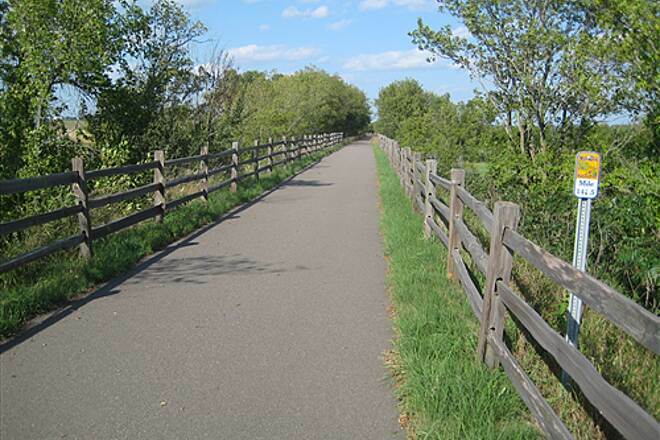 In the east, a planned 7-mile rail-with-trail extension will eventually bring the Lake Wobegon Trail to St. Cloud on the Mississippi River. 3 miles of that extension has been opened, bringing the eastern endpoint to River's Edge Park in Waite Park. The trail parallels I-94/US 52 for its entire length. 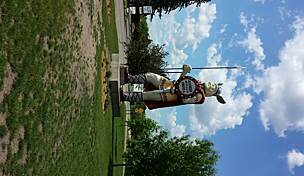 To reach the western trailhead in Osakis, take I-94 E. to Exit 114 for County Road 3/MN 127 (Osakis/Westport). Head northeast on MN 27, and in 1.7 miles turn left onto First Ave. E. In 0.7 mile turn left onto Main St. and find parking along the street. For the trailhead in St. Joseph, take I-94 to Exit 160. Head northeast on CR 2, and go 1 mile. Turn right onto CR 75, and go 0.9 mile. Turn left onto College Ave. N., and in 0.1 mile turn right onto Elm St. E. Parking will be on the left. Additional parking and other amenities can also be found in most towns along the trail’s route, including in Albany for the northern trail extension. For parking along the trail extension in Holdingford, take I-94 to Exit 153. Head north on CR 9/Fourth St./Avon Ave. S., and go 9.5 miles. Turn left onto River St. In 0.2 mile the parking lot will be on the right. For parking in Albany, take I-94 to Exit 147. Head north on Eighth St., and go 0.2 mile. Turn right onto Railroad Ave. In 0.2 mile turn right onto Fifth St. and reach parking along the trail. Follow the trail 1.1 miles west to reach the beginning of the trail extension to Holdingford. It's Lady Slipper Time on the Lake Wobegon Trail!! Every year sometime between Father's Day and the 4th of July the Minnesota State Flower blooms along the Lake Wobegon Trail. There's even a bike ride dedicated these lovely flowers and it's call the "Lady Slipper Nature Ride" and MN Master Naturalists are stationed along the trail to share their knowledge and answer questions about the flowers or any other natural aspects of the trail. This native orchid is the Showy Pink & White Lady Slipper. It's flower looks like baby's moccasin and is also referred to as the moccasin flower. 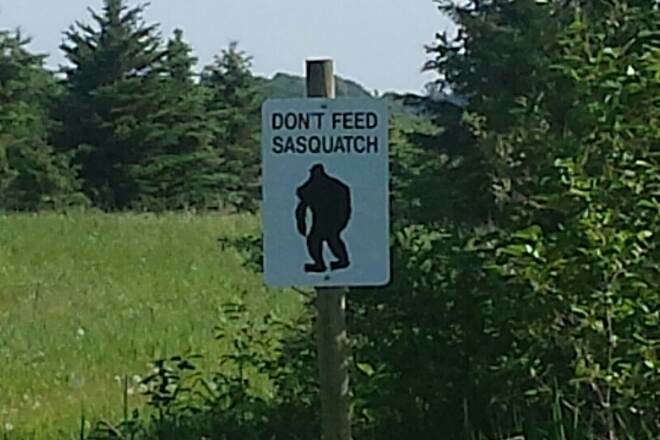 It's protected by state law making it illegal to dig them up or to pick them. But you can take all the photos you want! Just don't get too close to them or you can potentially kill the plants. Use the zoom on your camera to get that close up picture! They require a unique environment to grow including a boggy soil, filtered sunlight and a special fungus in the soil for them to mature and create their stunning flowers! It can take up to 15 years for the first flower to appear. So enjoy them as I do every year but try not to stand too close and risk compacting the soil and killing these lovely native orchids.... Happy Trails! Where all the riders are above average! 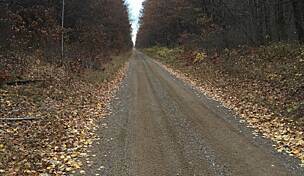 This is a great, pastoral trail that takes one from the historic railroad town of Albany, MN north to the Mississippi River at Blanchard Dam. The I-94 sections are noisy but head north for beautiful scenery and an idyllic ride! 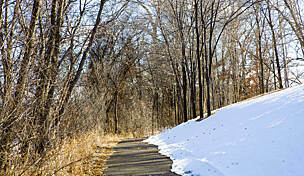 This is a great multipupose trail for all seasons. Mostly paved. Runs from St.Cloud with connections to Fargo. Many off shoot trails to the North and South. Former railroad line. 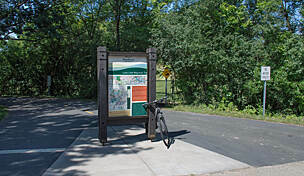 Lake Wobegon Trail and Central Lakes Trail are now one continuous 102 mile trail from St Joseph to MN 210 just SE of Fergus Fall. There is also a 24 mile long asphalt trail between Albany and US 10. 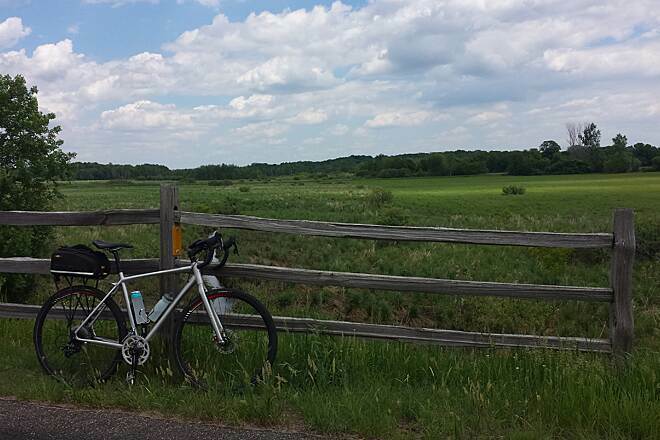 "Easy ride, but little variety"
"The Lake Woebegon Trail has to compete with a Minnesota trail system that boasts a number of truly spectacular rides. LWT is not one of them. It's a well-constructed trail, easy enough to ride, but offers little variety in terrain and not much in the way sightseeing. If you take this trail, check out the side excursions. Also, we have found the trail to be hot, windy, and lacking shade in midsummer; it makes for a much more agreeable ride in late spring or early autumn. Since we ride partly to eat, we have to recommend a stop at Charlie's in Freeport (which also gives you a chance to stroll through the inspiration for Lake Woebegon). Sauk Centre, home of Sinclair Lewis at trail's end, has nice accommodations."